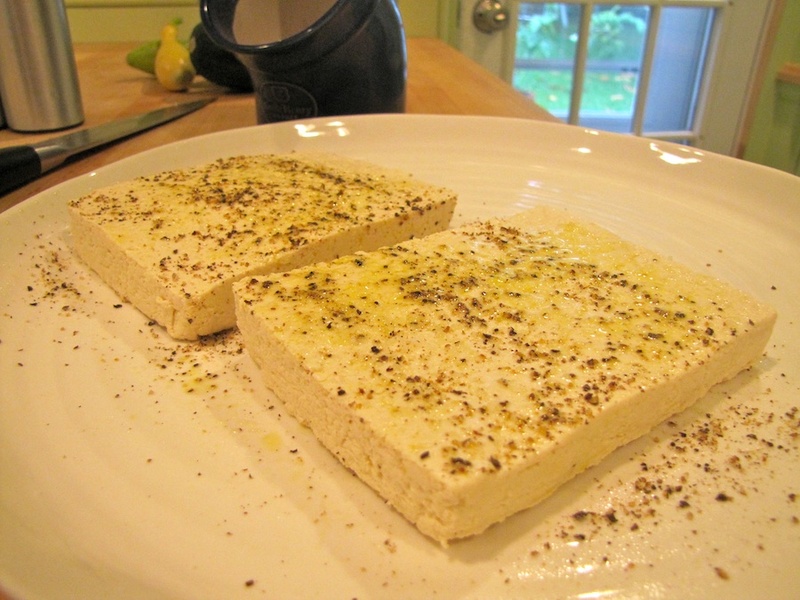 Wrap your tofu in paper towels, cheesecloth or a thin dishtowel and press it. I put the wrapped tofu on a cookie cooling rack in the sink, top it with a small cookie sheet and place a couple of cans of chick peas on it to press out the packing liquid/tofu funk water. Press for 20 - 30 minutes. You may need to change your wrapping halfway through, it can get pretty sloppy. 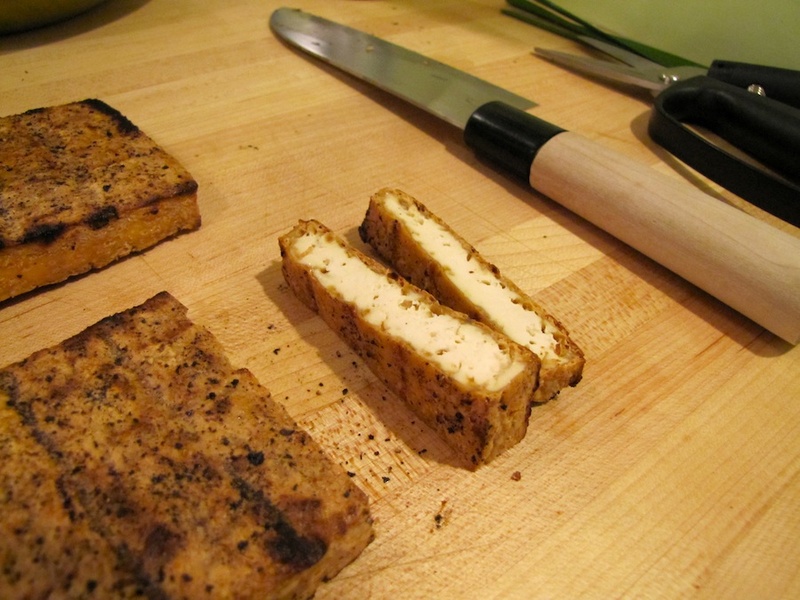 When it is done, unwrap your tofu and cut it in half horizontally. Oil and season it and get read for the grill. While you’re waiting for the tofu, start on the pesto. Toast the walnuts in a warm oven or toaster oven (watch, they’ll burn), chop the parsley (2 cups, tightly packed) grate the cheese. You get the idea. Combine the parsley, walnuts, cheese, garlic and salt in your food processor. Pulse it until combined (you may need to scrape down the sides a time or two). In a small bowl, combine oil, lemon juice and zest. Add the oil mixture to the parsley in a slow stream, pulsing to combine. Serve it or freeze it. It freezes well, so you can make a ton of it and bust it out to freshen up a pasta dish and tell the mid-winter blues to scram. Make the quinoa according to the package directions. All we have available is packaged quinoa, so that’s all I can tell you. We make a cup and it makes enough to feed us plus leftovers. Prep your veg. Cut the eggplant into rings, salt and set aside on a towel. Depending on the squash-to-grill-grate ratio I cut them differently: half, quarters, eighths, rings – just do what you think is best. 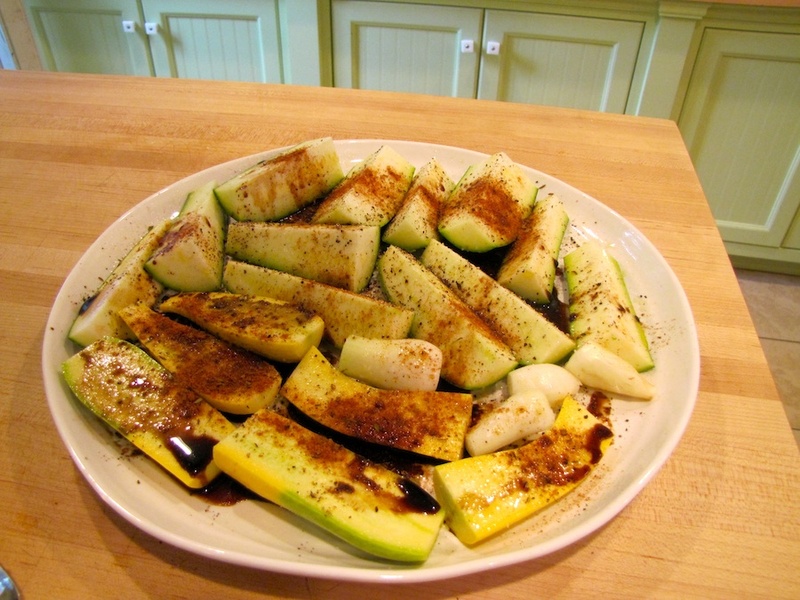 Spray them with a little oil, then salt and pepper to taste. Sometimes we add a little 8th Wonder Seasoning (made by a friend of mine), paprika or chili powder. Clean the Portobello mushrooms by scraping out the gills. A little oil, salt and pepper and they are ready to go. Chop the broccoli and separate it into bite-sized pieces, season it and set aside. Now for the grill. 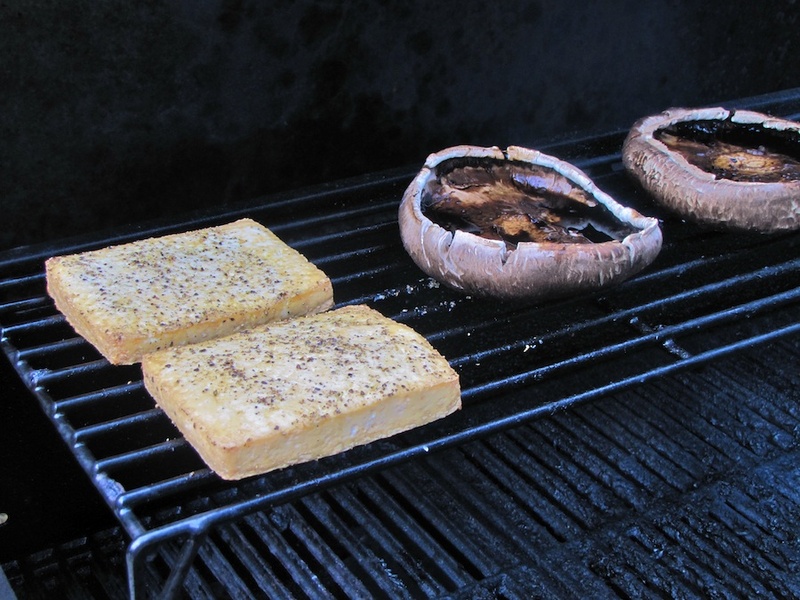 Oil the grates, start the grill and throw on the tofu and mushrooms. The tofu always goes on cut side up because the cut side will stick like mad no matter how much you oil the grates, until it’s cooked a bit a firmed up, that is. Mushrooms go on top down on the top rack. I usually put some sort of liquid in the mushrooms now – balsamic vinegar and some basil, a little wine, teriyaki, something to flavor them up a bit. Close the lid and leave it alone for 10 minutes. Go clean up the kitchen, play Wii, check out your garden, do something, just leave it alone. Or go rinse and season the eggplant if you haven’t already. When 10 minutes has elapsed, check the tofu and mushrooms. Hopefully the tofu is getting a nice golden brown color and starting to get crispy. If this is not the case, close the lid and give it five minutes before you check again. If it’s getting crispy, rotate it (don’t flip yet, rotate it). Give it another few minutes, call it 8 minutes. In the meantime go get the rest of the veg. 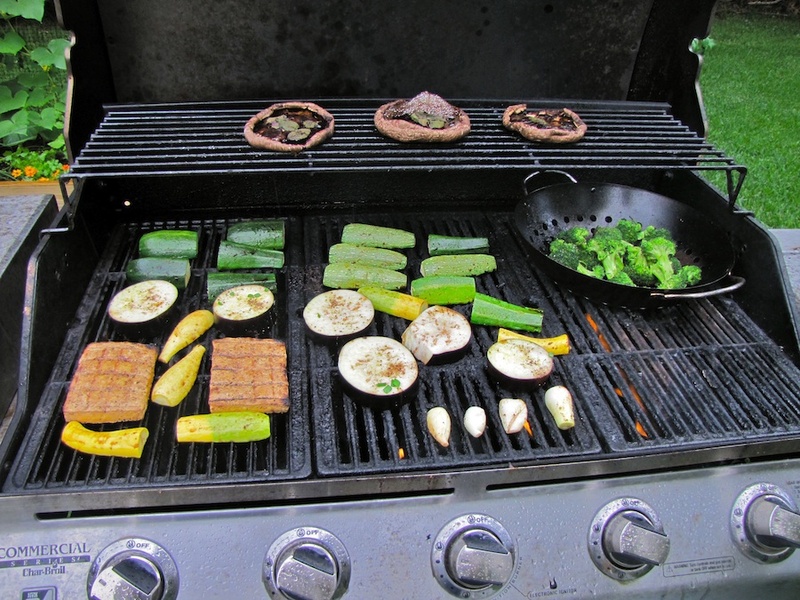 Open the grill and flip the tofu. Oil the grates where the veg will go and add your veg. I roast my broccoli in a little grill wok, but a cast-iron skillet will do the job too. Close the lid and give it five minutes. After time is up, flip, twist, rotate the veg, and toss the broccoli. Close the lid and give it a few more. Get your bowl ready because this stuff is about to be done. Once it’s all grilled to your taste, take it all inside to your cutting board. 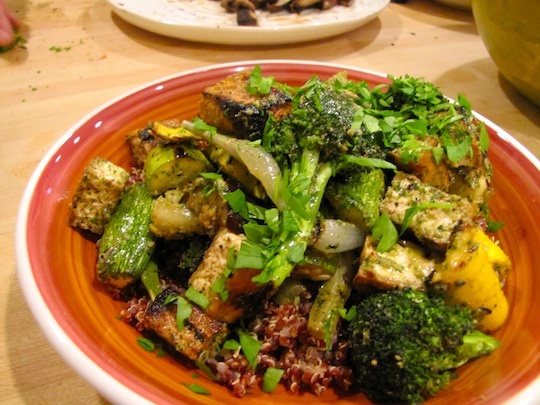 At the cutting board, set the tofu and eggplant aside to cool and begin chopping your other vegetables into bite-sized pieces. 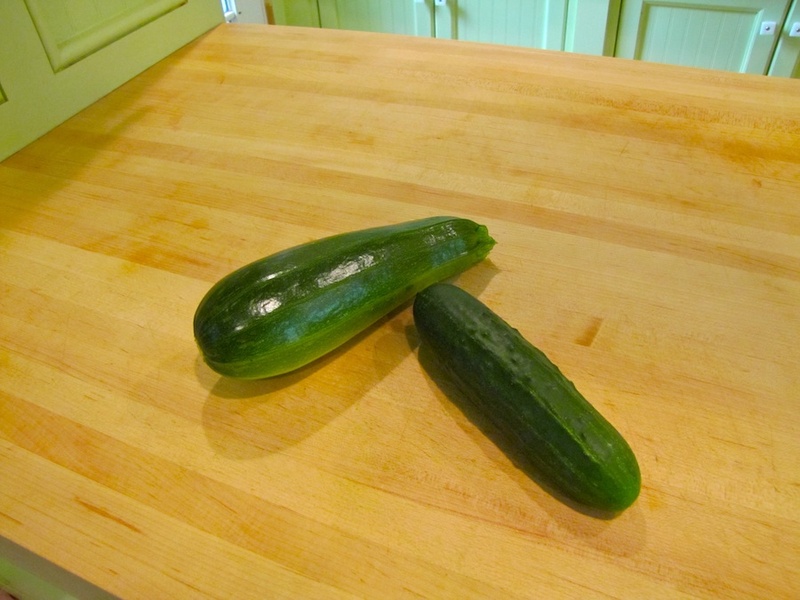 As soon as you cut it, add it to your serving dish. When the tofu is cool to the touch, cut into small cubes. You should notice a nice crunch and the outside will be a beautiful golden-yellow with the inside creamy white. Cut the eggplant and peel the skin (I peel it anyway, it’s kind of tough). 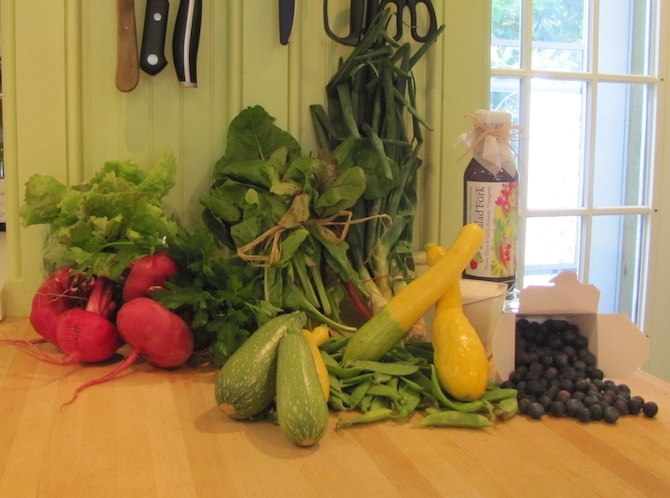 Now that everything is cut and in the serving dish, pour on your pesto and toss to combine. By now you’re hungry, but be strong, you’re almost there. Quinoa into bowl, pesto veggies onto quinoa, chop some parsley (or chives or whatever) and top it off. Grab your fork and dig in.